For the first time, investors and traders across the nation will be able to get live perspective on the market from experienced professional traders. “Power Trading Radio” is aimed at an audience that wants to improve its edge through active participation whether the market is moving up, down or sideways. In addition to stocks, topics will include foreign exchange, options and wealth management. “The philosophy of ‘Buy and Hold’ may not be dead, but it’s in a coma,” states co-host Merlin Rothfeld. “Our listeners demand timely, actionable information that can help them move their money where they find the greatest potential.” Rothfeld is joined in an interactive panel format by Mike McMahon, Tilly Allison and John O’Donnell, all seasoned traders who are also professional instructors. The show also features a live and interactive feature called a POWER BLAST, where listeners can get evaluation of their trades or state their own viewpoints, LIVE and in real time during the show. 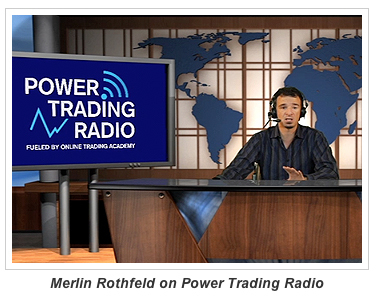 “Power Trading Radio” is sponsored by Online Trading Academy, a global network of financial education centers focused on teaching students the art of trading since June of 1997. Online Trading Academy offers instruction from experienced professional traders, as well as a wide array of beneficial home study materials to supplement classroom study. Over 200,000 investors have experienced Online Trading Academy’s Education with classroom locations that include: Phoenix, Irvine, Los Angeles, Sacramento, San Diego, San Jose, Denver, Norwalk, Fort Lauderdale, Orlando, Tampa Bay, Atlanta, Chicago, Kansas City, Baltimore, Boston, Detroit, Minneapolis, Ridgefield Park, Long Island, New York City, Charlotte, Raleigh, Cincinnati, Philadelphia, Austin, Dallas, Houston, Seattle, Washington D.C., Milwaukee, Dubai, Jakarta, London, Singapore, Mumbai, Vancouver and Toronto.